In the midst of the frenzied departure from Hanoi for our "ten day trip", somehow my ever so comfortable REI boxers were tragically omitted from my panniers. Leading up to our departure from Seattle, I found the perfect pair that would be light, breathable, packed down well, and would be easy to wash. I may have even bought a dozen or more and shipped a few to Australia too! It’s funny to think of how well prepared I felt, secure in the knowledge that my most basic of personal protection needs was met and surpassed. To then realize halfway along the journey out of Hanoi that they were nowhere to be found, sent me into a bit of a panic and a number of playful self-effacing comments and private dances of dumbfounded astonishment ensued. Quote of the week: "You realize of course that comfy boxers aren't something we can just go down the street and buy now because we’re sitting here in the middle of Laos and have a couple of Vietnamese motorbikes sitting out front!" Finding replacements would surely not be possible here in Laos so some sort of acceptable stand-in is going to need to be acquired ... and fast! This single pair that I've now been wearing for days washing by hand every other day in the sink is not a workable long-term situation! Thankfully, the owner of our guesthouse was so incredibly knowledgeable and happy to run with all sorts of great questions, regardless of how obscure or even how silly they must have sounded to her. She directed us to the Phosi Market in the outskirts of town on the road towards the Kuang Si Falls. A little desperation and optimism provided enough incentive to get out there ASAP so on the motorbikes we went. 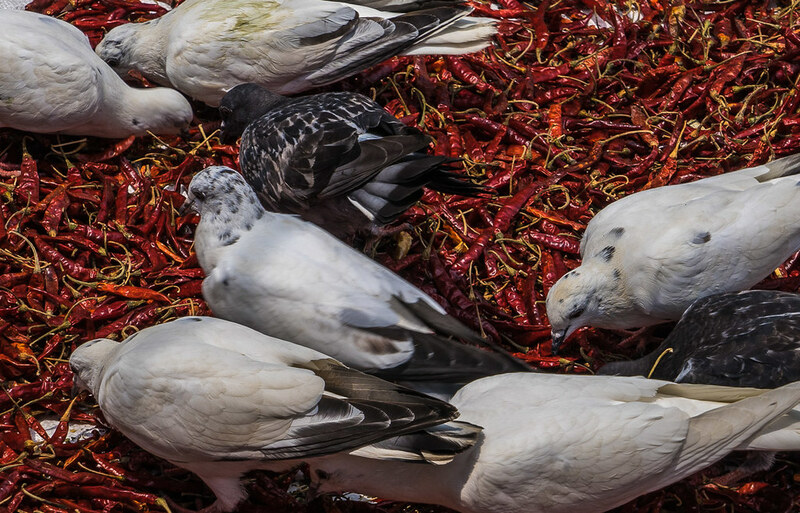 There was also a lovely mutualistic exchange in progress between the pigeons and the chili lady's wares. Upon arrival, the whole "park the motorbike and figure out who to pay and how much to pay" game began. This game is a fun little game to play in Asia because the attendants providing their "service", e.g. taking your money and pointing to where to park your motorbike, may or may not have a piece of paper showing you the actual price for parking, may or may not charge you the honest price if there is no paper, may or may not even be legit attendants, and most certainly speak no English with which you can question them if you don't understand the rules of the game. Watching others go in first is preferable but when not possible, here in Asia at least, place your bets on their honesty and hand them a small'ish bill and hope for some change. From what we could initially see, after thoroughly amused with the parking situation here, this market was indeed our best bet in town. Exploring every nook and cranny of the labyrinth wound us around what felt like an infinite fractal curve of same same but different spatial coordinates. Inside; household items, personal goods, apparel, and footwear. From one end of the market to the other, you guessed it more of the same. Outside; hardware items, fruits and veggies, a vast assortment of fresh and feisty fish floundering fluidly about in fancy bubbling fishbowls and all sorts of unidentifiable things in between. Quite the experience and ultimately quite an abysmally absent selection of boxer shorts for yours truly. Looks like I'm having a forced conversion to, oh heavens no, the doctrine of the holy boxer brief! Buy the largest pair you can find and hope for the best!!! ← Why on earth would you want a new one?